Konuşmada bulunan sesbilgisel değişkenlerin hangi toplumsal anlamlarla algılandığı toplumdilbilimin son yirmi yılında sıklıkla yöneltilen araştırma sorularından biridir. Bu soruya yönelik geliştirilen kuramsal tartışma ise toplumsal anlamın üretim ve algı sırasında devimsel ve bütünleşik bir bilgi birikimi ile toplumda var olduğu yönündedir. Algı ile birlikte gelen toplumsal anlam, konuşmanın hangi bağlamlarda algılandığı ve dinleyicinin algıyı gerçekleştirirken hangi toplumsal bilgiye eriştiği gibi değişkenlere bağlıdır. Bu yönelimle çalışma, dilsel biçimler ve toplumsal anlam arasındaki geleneksel ve basmakalıp bağlantıyı açıklamak için toplumdilbilimin son dönemlerinde kullanılan belirtisellik ve toplumdilbilimsel duruş kavramlarına ilişkin tartışmaları sunmakta ve bu tartışmayı Türkçedeki [ɹ] sesbilgisel değişkeni üzerine gerçekleştirilen bir grup görüşmesi verisini durum olarak ele alarak uygulamaktadır. Perception of phonetic variables alongside social meanings has been the preliminary research question in the field of sociolinguistics in the last twenty years. The theoretical debate fostered in answering this research question is that the social meaning is found dynamically and cumulatively in the society during production and perception. The nature of social meaning in perception is dependent upon such factors as which contexts are found in the environment where the perception occurs and what social information is accessed by the listeners. In that vein, this study presents the current discussions on the notions indexicality and sociolinguistic stance that have been employed to bring an understanding to the conventional and stereotypical relationships between linguistic form and social meaning in the recent stages of sociolinguistics, and employs it on two group interviews as a case that has been conducted on the perception of the sociophonetic variable [ɹ] in Turkish. Agha, A. (2003). The social life of cultural value. Language & Communication, 23(3), 231-273. Bakhtin, M. (1981). The dialogic imagination (Çeviren M. Holquist & C. Emerson). Austin: University of Texas Press. Bourdieu, P. (1984). Distinction: A social critique of the judgment of taste (Çeviren R. Nice). Cambridge: Harvard University Press. Bucholtz, M. & Hall, K. (2005). Identity and interaction: a sociocultural linguistic approach. Discourse Studies, 7(4-5), 585-614. Bucholtz, M. & Hall, K. (2008). All of the above: New coalitions in sociocultural linguistics1. Journal of Sociolinguistics, 12(4), 401-431. Campbell-Kibler, K. (2006). Listener perceptions of sociolinguistic variables: The case of (ING). (Doktora Tezi). Stanford University. Campbell-Kibler, K. (2011). Intersecting Variables and Perceived Sexual Orientation in Men. American Speech, 86(1), 52-68. Chun, E. (2004). Ideologies of legitimate mockery: Margaret Cho’s revoicings of mock Asian. Pragmatics, 14, 263–289. Clayman, S. E. (1992). Caveat orator: audience disaffiliation in the 1988 presidential debates. Quarterly Journal of Speech, 78, 33–60. Clopper, C. G. & Pisoni, D. B. (2004). Effects of Talker Variability on Perceptual Learning of Dialects. Language and Speech, 47(3), 207-238. Coupland, N. (2007). Style: Language variation and identity. Cambridge: Cambridge University Press. Coupland, J. & Coupland, J. (2009). Attributing stance in discourses of body shape and weight loss. A. Jaffe (Yay. haz. 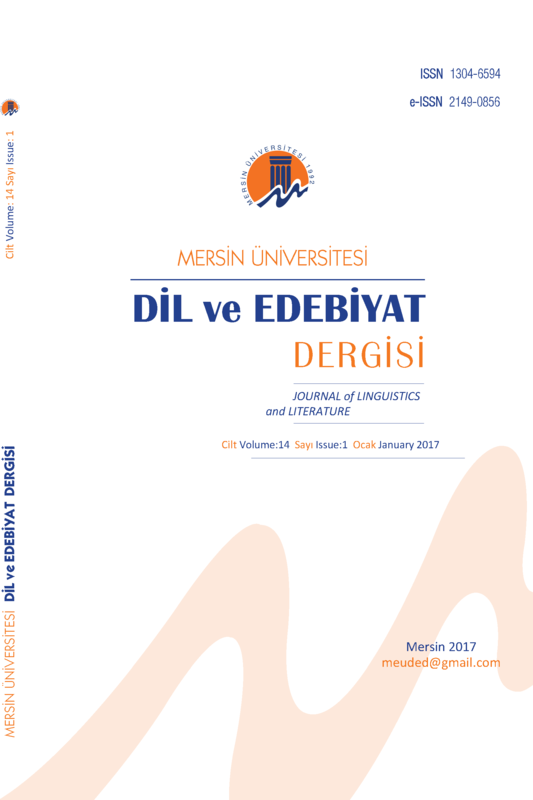 ), Stance: Sociolinguistic perspectives içinde (s. 227-250). Oxford&New York: Oxford University Press. D'Onofrio, A. (2015). Persona-based information shapes linguistic perception: Valley Girls and California vowels. Journal of Sociolinguistics, 19(2), 241-256. Drager, K. (2010). Sociophonetic variation in speech perception. Language and Linguistics Compass, 4(7), 473-480. Du Bois, J. (2007). The stance triangle. R. Englebretson (Yay. haz. ), Subjectivity, evaluation, interaction içinde (s. 139-182). Amsterdam: John Benjamins. Eckert, P. (2000). Linguistic variation as social practice. Oxford: Blackwell. Eckert, P. (2008). Variation and the indexical field. Journal of Sociolinguistics, 12(4), 453-476. Eckert, P. (2016b). Variation, meaning and social change. N. Coupland (Yay. haz. ), Sociolinguistics: Theoretical Debates içinde (s. 68-85). Cambridge: Cambridge University Press. Englebretson, R. (2007). Stancetaking in discourse: An introduction. R. Englebretson (Yay. haz. ), Stancetaking in discourse içinde (s. 1-26). Amsterdam: John Benjamins. Fridland, V., Bartlett, K. & Kreuz, R. (2004). Do you hear what I hear? Experimental measurement of the perceptual salience of acoustically manipulated vowel variants by Southern speakers in Memphis, TN. Language Variation and Change, 16(1), 1-16. Goodwin, M. H. (1998). Games of stance: Conflict and footing in hopscotch. C. T. Adger & S. Hoyle (Yay. haz. ), Kids talk: Strategic language use in later childhood içinde (s. 23-46). New York: Oxford University Press. Glenn, P. (2003). Laughter in interaction. Cambridge: Cambridge University Press. Hay, J. (2000). Functions of humor in the conversations of men and women. Journal of Pragmatics, 32(6), 709-742. Hay, J., Warren, P. & Drager, K. (2006). Factors influencing speech perception in the context of a merger-in-progress. Journal of Phonetics, 34(4), 458-484. Jaffe, A. (2009). Stance: Sociolinguistic perspectives. Oxford&New York: Oxford University Press. Jaffe, A. (2016). Indexicality, stance and fields in sociolinguistics. N. Coupland (Yay. haz. ), Sociolinguistics: Theoretical Debates içinde. (s. 86-112). Cambridge: Cambridge University Press. Johnstone, B. (2009). Stance, style, and the linguistic individual. Alexandra Jaffe (Yay. haz. ), Stance: Sociolinguistic Perspectives içinde (s. 29-52). Oxford: Oxford UniversityPress. Kiesling, S. F. (2009). Style as stance: Stance as the explanation for patterns of sociolinguistic variation. A. Jaffe (Yay. haz. ), Stance: Sociolinguistic Perspectives içinde (s. 171-194). New York: Oxford University Press. Koops, C., Gentry, E. & Pantos, A. (2008). The effect of perceived speaker age on the perception of PIN and PEN vowels in Houston, Texas. University of Pennsylvania Working Papers in Linguistics: Selected papers from NWAV, 36, 91-101. Labov, W. (1963). The social motivation of sound change. Word, 18, 1-42. Labov, W. (1966). The Social Stratification of English in New York City. Cambridge: Cambridge University Press. Levon, E. (2006). Hearing “gay”: Prosody, interpretation, and the affective judgments of men’s speech. American Speech, 81(1), 56-78. Levon, E. (2007). Sexuality in context: Variation and the sociolinguistic perception of identity. Language in Society, 36(4), 533-554. Levon, E. (2014). Categories, stereotypes, and the linguistic perception of sexuality. Language in Society, 43(5), 539-566. Linstead, S. (1985). Jokers wild: the importance of humour in the maintenance of organizational culture. The Sociological Review, 33(4), 741-767. MacFarlane, A. E. ve Stuart-Smith, J. (2012). 'One of them sounds sort of Glasgow Uni-ish'. Social judgements and fine phonetic variation in Glasgow. Lingua, 122(7), 764-778. Mack, S. ve Munson, B. (2012). The influence of /s/ quality on ratings of men's sexual orientation: Explicit and implicit measures of the ‘gay lisp’ stereotype. Journal of Phonetics, 40(1), 198-212. Mendoza-Denton, N. (2008). Homegirls: Language and cultural practice among Latina young gangs. Malden, MA: Blackwell. Niedzielski, N. (1999). The effect of social information on the perception of sociolinguistic variables. Journal of Language and Social Psychology, 18(1), 62-85. Ochs, E. (1992). Indexing gender. A. Duranti ve S. C. Levinson (Yay. haz. ), Rethinking context: Language as n interactive phenomenon içinde (s. 335-358). Cambridge: Cambridge University Press. Ochs, E. (1996). Linguistic resources for socializing humanity. J. J. Gumperz ve S. C. Levinson (Yay. haz. ), Rethijkanking linguistic relativity içinde. (s. 407-437). Cambridge: Cambridge University Press. Osborne, K. & Chapman, A. J. (1977). Suppression of adult laughter: an experimental approach. A. J. Chapman and H. C. Foot (Yay. haz. ), It’s a funny thing, humour (s. 429–431). Oxford: Pergamon. Peirce, C. S. (1932). The Icon, Index, and Symbol. C. Hartshorne & P. Weiss (Yay. haz. ), Collected papers of Charles Sanders Peirce, Volume 2: Elements of Logic içinde (s. 156-173). Cambridge, Massachusetts: Harvard University Press. Purnell, T., Idsardi, W. ve Baugh, J. (1999). Perceptual and Phonetic Experiments on American English Dialect Identification. Journal of Language and Social Psychology, 18(1), 10-30. Sacks, H., Schegloff, E. A.ve Jefferson, G. (1974). A Simplest Systematics for the Organization of Turn-Taking for Conversation. Language, 50(4), 696-735. Silverstein, M. (1976). Shifters, linguistic categories, and cultural description. K. H. Basso & H. A. Selby (Yay. haz. ), Meaning in anthropology içinde (s. 11-55). Albuquerque: University of New Mexico Press. Silverstein, M. (2003). Indexical order and the dialectics of sociolinguistic life. Language & Communication, 23(3), 193-229. Staum Casasanto, L. (2008). Experimental investigations of sociolinguistic knowledge. (Doktora tezi). Standford University, Palo Alto. Strand, E. A. (1999). Uncovering the Role of Gender Stereotypes in Speech Perception. Journal of Language and Social Psychology, 18(1), 86-100. Sumner, M. & Samuel, A. G. (2009). The effect of experience on the perception and representation of dialect variants. Journal of Memory and Language, 60(4), 487-501. Thomas, E. R. (2000). Spectral differences in /ai/ offsets conditioned by voicing of the following consonant. Journal of Phonetics, 28(1), 1-25. White, P. R. R. (2003). Beyond modality and hedging: A dialogic view of the language of interactive stance. Text, 23(2), 259-284. ISNAD Yağlı, Emre . "Duruş ve Sesbilgisel Değişken Algısı". Dil ve Edebiyat Dergisi 16 / 1 (January 2019): 39-59.